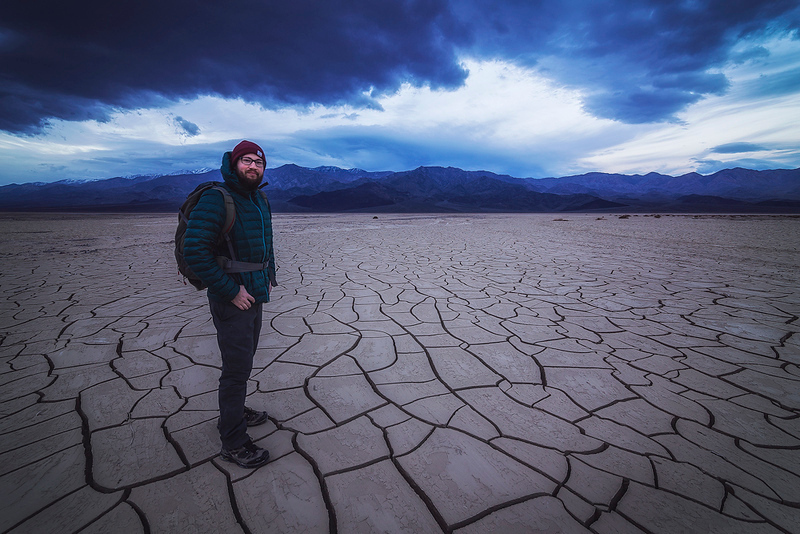 A self portrait standing within a massive dried mud playa in Death Valley National Park. The dramatic clouds gave way to heavy rains not long after I left the playa. First, thank you for taking your time to view and explore my photography. My photographic journey began long before I even knew I would have one. At age 13, my family and I had moved across the country from Philadelphia, PA to Phoenix, AZ. I assumed Arizona was pretty much a flat sandy cactus filled landscapes as far as the eye could see. It quickly became apparent that this was not true. In my junior year of high school, I took a photography class that had still used film. I learned how to develop my own photographs as well as the very basics of how to make a photograph, or so I thought. A few years later, I had purchased my own digital camera. I would take photos of almost anything, but more and more I found myself drawn to photographing nature and the landscapes surrounding me. I began searching the web and reading photography books and finding photographers and artists who could inspire me. The desire to travel and be outside with the camera became stronger and stronger. Eventually, I began going on a few short trips with friends to explore new places and it started to become a regular occurrence to be outside looking for something to photograph. It wasn't until I took my first solo trip to photograph the Eastern Sierra area of California in 2012 when I realized that this was what I wanted to do in life. Shortly after, my work began to be recognized by publications and the general public. I won the Arizona Highways Magazine photo contest in 2015, and began working with companies who I have built relationships with over the years. My camera has taken me to some of the most beautiful landscapes in the western United States, and I expect it will take me to every corner of the world to further my exploration. I am eager and excited to see where this journey in life will take me. A list of my awards, accomplishments, and publications can be found below. 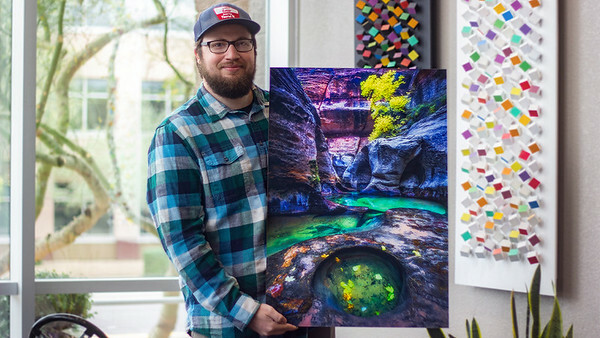 Myself holding a 20x30 inch luxury museum quality acrylic print of my photograph titled "Revived", from Zion National Park in Utah. These are the highest quality prints I offer and make the perfect additions to your home, office, restaurant, or place of business. What can my photographs do for you? I have specialized in large fine art prints on paper, metal, and acrylic surfaces to decorate your home, office, or place of business. I work with and have worked with art consultants and interior designers incorporating my photographs to the walls of healthcare facilities to bring positivity, hope, and wellness to patients and medical professionals alike. In addition to healthcare facilities, my work has also been incorporated in corporate office spaces and private residences to bring light, color, and life to bare walls. If you are an art consultant or interior designer and would like to incorporate my work into your next project or future projects, please do reach out to me. If you are looking for that perfect print to display over the couch or fireplace, or want to fully decorate your entire home, please reach out to me or browse the photographs on the website here. Often times people want to buy a print of mine because the image reminds them of a special time in their life and they want to cherish that moment for the rest of their lifetime. Other times, it is a matter of having the right subject matter to compliment other decor in their homes as well as color palettes. If you are curious about how a print will look and the size you may need before you make your purchase, please inquire about free room mockups where I can show you how a piece may look on your preferred wall space. Simply use the contact form to inquire and give some general information into your color preferences, subject matter, and size. Once we have established some possible print options, take a photo of the space you are thinking of displaying your piece(s) and send it back to me with exact or approximate sizes of furniture (chairs, bed, tables, couch, etc). This will allow me to mock up size appropriate pieces right onto your photo so you can see how they may look in real life before you place your order. Have multiple rooms you are considering? Send me a photo of each space you are thinking about and I will happily create your mockups at no charge. In addition to all the printing, I also license digital copies of the images for your marketing and advertising needs. No job is too small and I am always happy to work with new and former clients again. Feel free to reach out via the contact form to inquire about your licensing needs. While I specialize in fine art printing, I am also available to work on any marketing and advertising campaigns to create new content for your brand and may be commissioned for specific types of photographic work to fit your projects needs. 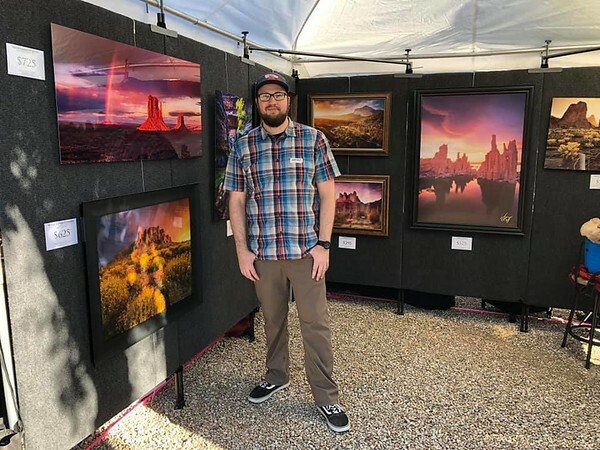 A quick snapshot of me during my very first art show in Gold Canyon in January 2019. This was the first time I had my work on public display. The photographs you see on this website are a labor of love and passion that I put my blood, sweat, and tears into, quite literally. These are the experiences and moments in nature I wish to share with the world and invite you all on this journey with me. All of the photographs you see on this website have been photographed using digital cameras over the last decade. I think it is important to note that all of the images you see on my website have been "processed" or "enhanced" to some degree to showcase how the scene looked to me as an artist. Often times people may say a scene is so unbelievable that it could not have possibly looked like that in real life. I have spent many days in the field seeing conditions that most people will never experience in these beautiful places. You can be assured that when viewing my photographs that all aspects of an image have occurred during the time of pressing the shutter of the camera. I use Adobe Photoshop to process these images and bring them to life. Much of this processing is simple RAW adjustments making sure that things such as color, contrast, clarity, highlight and shadow recovery are to my preferences. Some images may be blended together to compensate for bright highlights or deep shadows as to avoid extremely bright areas and extremely dark areas just like in a real darkroom. A handful of images have also been blended together combining multiple focal points to achieve maximum depth of field and focus for ultimate detail. None of the images in my galleries are composite scenes (two separate scenes from different dates and areas combined together). All wildlife images posted on my website are of truly wild animals photographed in our National Parks and public lands. No animal is ever baited or harassed to get the shot. I take a lot of pride in trying to get the shot as close to what I envisioned in camera. This often results in many hours standing in what many consider miserable weather to wait for that perfect moment and putting myself in a position to press the shutter at just the right time. I am always sure to practice leave no trace principals and make sure the landscape is left better than I found it (removing unwanted trash, etc). It is imperative that these lands remain free and wild for generation after generation to enjoy and explore. -Epson Pano Awards 2018 Silver award (Light of the New Year, Panoramic) plus two bronze awards. -3rd Place (Consumer) Epson Pano Awards, Digital Art Category 2017. -Honorable mention (Light of the New Year) 2016 Arizona Highways Magazine photo contest. -Highly Commended (The River Speaks) 2016 USA Landscape Photographer of the Year photo contest. -The Big Interview eight page feature in Digital Photo Mag UK October 2015 issue. -Grand prize winner (Mountain Minions) 2015 Arizona Highways Magazine photo contest (published). -Honorable mention (Days End) 2015 Arizona Highways Magazine photo contest (published). 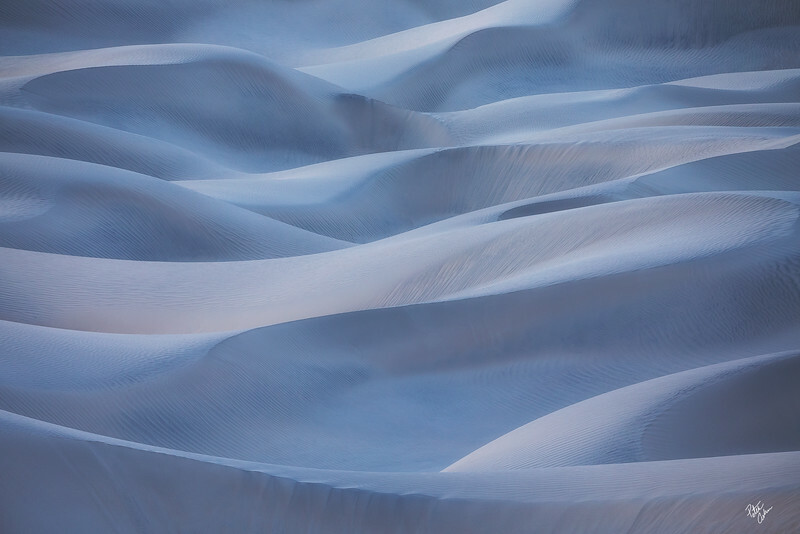 -Photographer of the Month for November 2015 on apertureacademy.com. You can read the full interview here Aperture Academy Interview. -Highly commended (Glow of the Gods, Light Through the Valley II) 2014 USA Landscape Photographer of the Year photo contest. -Fan Favorite (Light Catchers) 2014 Arizona Highways Magazine photo contest (published). -Honorable mention (Parade of Autumn) 2013 Arizona Highways Magazine photo contest (published).